Funny Tip Jars features humorous tipjar designs that you simply can't help but tip. The service industry is hard and tips make these workers their living. If you happen to find an unusually funny tip jar please submit it to to us, hopefully these workers will be rewarded in greater tips for their humor. I can't wait til someone adds some CHANGE WE CAN BELIEVE IN. Apparently, his patrons are voting Romney. For the guy targeting the admittedly humorous commenter, "Never argue with an idiot. They will drag you down to their level, and then beat you with experience." Jesus can can WALK on WATER, but Chuck Norris can SWIM in it. M: I lie on my back and you blow the sh** out of me. 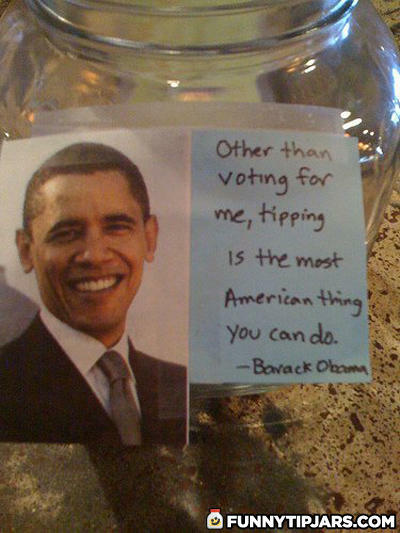 ©2008-2019 Funny Tip Jars. All rights reserved.